Many people are familiar with Popeye the Sailor, a popular fist fighting cartoon character of the 1920’s through 1960’s. Popeye sure knew what was good for him! Just before a brawl he would down a whole can of spinach to give him super strength and ensure his victory. It never disappointed. Every time Popeye ate his spinach, he won. In the United States, this spinach-loving cartoon character did a lot to popularize and increase demand for spinach. Manufacturers saw about a 30% increase in sales thanks to Popeye. But does spinach actually make you stronger? Spinach will not give you temporary super strength like Popeye. Nevertheless, it is a nutritional powerhouse worthy of inclusion in your diet. Spinach is a dark leafy green vegetable that is rich in vitamins A, C, E and K, manganese, iron, folate, riboflavin and potassium. Plus, it is a good source of dietary fiber and a potent source of antioxidants. Eating spinach provides many health benefits. It may decrease your risk of osteoporosis, cataracts, macular degeneration, heart disease and certain cancers, such as colon, ovarian and prostate cancer. Plus, it helps to promote eyesight and gastrointestinal health and boosts energy levels. Do I have to eat cold spinach out of a can like Popeye? Pasta: Add steamed chopped spinach to lasagna or any other pasta recipe that you enjoy. It will not only improve the taste, but also the nutrient profile of this comfort food. Dip: Make a spinach dip and eat it with your favorite crunchy raw vegetables or with whole grain crackers. Omelet: Add spinach to your favorite omelet recipe. Sandwich: Instead of using lettuce, put some spinach in your sandwich. Spinach is a highly nutritious food that has Popeye’s seal of approval and mine as well. So, if you don’t eat it already, you should. And if your kids don’t like it, maybe Popeye can convince them. If you want to be healthy, it is a great choice because it tastes great and packs a healthy punch. Just not the kind of punch that Popeye made it famous for. We love spinach at our house. I even put spinach in my chicken vegetable soup. it tastes great! 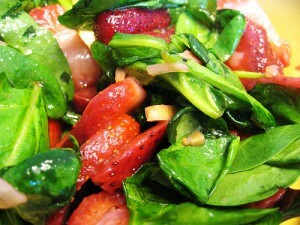 Love spinach with everything…especially on sandwiches and in omelets. Such a good and healthy food!